Understanding wealth in the United States--who has it, how they acquired it, and how they preserve it--is crucial to addressing the economic and political challenges facing the nation. But until now we have had little reliable information. Edward Wolff, one of the world's great experts on the economics of wealth, offers an authoritative account of patterns in the accumulation and distribution of wealth since 1900. A Century of Wealth in America demonstrates that the most remarkable change has been the growth of per capita household wealth, which climbed almost eightfold prior to the 2007 recession. But overlaid on this base rate are worrying trends. The share of personal wealth claimed by the richest one percent almost doubled between the mid-1970s and 2013, concurrent with a steep run-up of debt in the middle class. As the wealth of the average family dropped precipitously--by 44 percent--between 2007 and 2013, with black families hit hardest, the debt-income ratio more than doubled. The Great Recession also caused a sharp spike in asset poverty, as more and more families barely survived from one paycheck to the next. In short, the United States has changed from being one of the most economically equal of the advanced industrialized countries to being one of the most unequal. 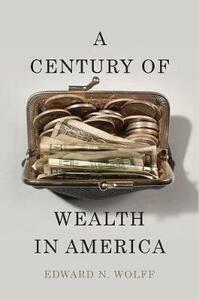 At a time of deep uncertainty about the future, A Century of Wealth in America provides a sober bedrock of facts and astute analysis. It will become one of the few indispensable resources for contemporary public debate.